Monoethylene Glycol Market Size was estimated over USD 25 billion in 2016 and the industry will grow by a CAGR more than 6% up to 2024. 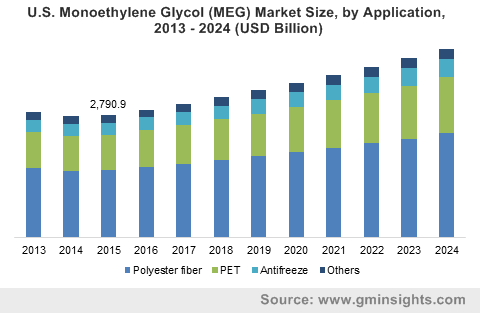 Monoethylene glycol market will witness growth as a primary raw material for the manufacturing of polyester fibers. Changing consumer lifestyle coupled with ongoing fashion trends of freshly designed apparels will drive the polyester fiber industry growth in coming years. Polyester fiber is often used in garments, outwears as well as carpets & rugs, ropes and other household products owing to its extraordinary properties such as durability, hydrophobic features and tenacity. In 2016, the global polyester fiber market accounted for over USD 85 billion and is likely to grow at a substantial rate in coming years. Asia Pacific is one of the most prominent and lucrative application markets for polyester fiber and recorded a valuation of over USD 50 billion in 2016. This is due to expansion of myriad industrial sector, rising spending power and a massive change in terms of consumer preferences and will support the MEG market penetration. Polyethylene terephthalate (PET) industry is on the surge owing to shifting trends towards wood, metal, and paperboard towards plastics in packaging industry and has significantly upscaled the monoethylene glycol market demand as the product is extensively used in PET production. Food & beverage and pharmaceutical packaging are the key contributors for the industry growth due to the predominant utilization of PET to produce packaging products such as films, sheets, bottles, etc. Ease of recyclability, dimension stability, good chemical resistance and barrier properties will boost the PET demand in several end-use domains over the forecast timeframe. In 2016, the overall production of PET was over 25 million tons and in terms of regions, Asia Pacific dominates the entire industry with over 50% share. China is the key PET producer, which accounts for 25% in Asia Pacific region. An increased preference toward bio-based products and fluctuation in oil prices are likely to dictate the trends in various end-use domains, which may cause considerable disruption in industry growth. The product is primarily driven from ethylene, a downstream product of crude oil. Fluctuating crude oil prices leads to fluctuating prices of raw materials, thus resulting in uncertainty among manufacturers. For an instance, in 2013, when the price of crude oil was at approximately USD 100 per barrel, global MEG prices were USD 1,200 per kilo ton. However, recent dip in crude oil prices in the latter half of 2014 led to decrease in monoethylene glycol price to as low as USD 750 per kilo ton in Asia Pacific. Polyester grade accounted for the largest revenue share in past years and is likely to witness the significant growth in forecast spell. The product is majorly used to produce polyester resins, fiber and PET owing to its hygroscopic nature, low-volatility and other properties. Hygroscopic nature makes it suitable as a conditioning agent in adhesives, synthetic rubber and other paper products. Extensive usage of the product in various applications such as solvent couples, chemical intermediates, plasticizers, heat transfer agents and unsaturated polyester resins. This in turn, will augment the MEG market demand in future. Industrial grade held a notable market share in 2016 and a significant revenue generation can be attributed to increasing demand of the product in variety of applications which requires high boiling point and good solvent features such as cleaners, paints & coatings, hydraulic fluids and other electronics products. This will further strengthen the industry penetration. Polyester fiber is the largest application segment of the monoethylene glycol market and was accounted for more than half of the overall share in 2015. Extensive usage of the fiber in several end-user industries such as textile, electronics, resins etc. due to its outstanding mechanical and chemicals characteristics will boost the segment demand in coming years. PET is the fastest growing application segment in monoethylene glycol market and is likely to expand with CAGR more than 6.5% by 2024. Increasing demand of the product in packaging industry owing to its excellent moisture and water vapor barrier properties. This will drive the MEG market demand in the near future, as a substantial usage of the product is to produce the PET. Asia Pacific MEG market is likely to be expanding at a CAGR a little short of 7% by 2024. Expansion of textile industry driven by an increase in disposable income coupled with economic growth is the crucial factor supporting the MEG market growth. Significant production of polyethylene terephthalate and polyester fiber in developing countries include India, China and this will create the immense demand of the product in this region. North America and Europe is likely to show a sluggish growth owing to presence of stringent regulations regarding the manufacturing of product. The monoethylene glycol production has shifted to developing economies which include Asia Pacific, Latin America, Middle East & Africa. This in turn, will significantly impact the product penetration in these regions. The predominant industry players include SABIC, The Dow Chemicals, Royal Dutch, AkzoNobel, Mitsubishi Chemical and Reliance Industries, which collectively holds over 45% of the total market share. The other companies include Lotte Chemical Corporation, Nan Ya Plastics Corporation, Sinopec Zhenhai Refining & Chemical Company, LyondellBasell Industries, MEGlobal, ExxonMobil Corporation, India Glycols and Chemtex Speciality Limited. In 2015, SABIC held over a tenth of the total market share and currently has presence throughout the value chain, right from ethylene production to plastic manufacturing. Hence, the company has a strong competitive edge in the monoethylene glycol market. Rising demand across end-use domains coupled with technological developments is likely to drive the monoethylene glycol market during the forecast period. The product is extensively used to produce the specialty fibers, and related products and these are further used in various domains such as packaging, textiles, automotive, etc. Furthermore, capacity additions in the Middle East and China are estimated to boost market growth.